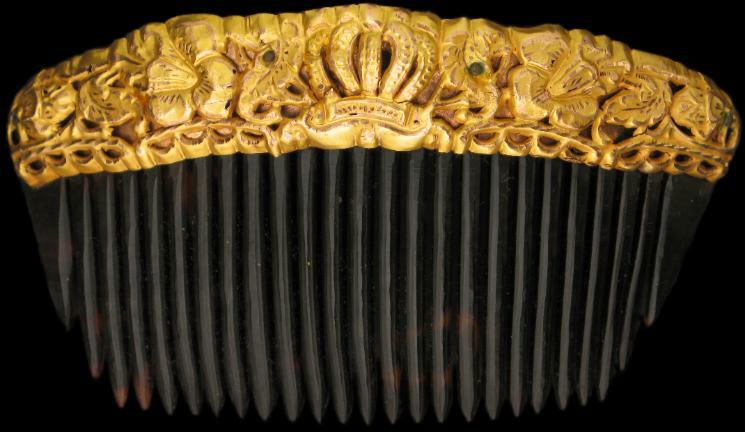 Combs such as this example were made in Luzon in the Philippines and appear to have been traded across the Malay world. The National Museum of Malaysia for example has several similar examples. With its abundant supply of gold, the Philippines became an important regional centre for jewellery making – early Spanish accounts noted the impressive goldsmithing techniques of the indigenous jewellers. This example comprises a thin gold sheet repoussed with tropical flowers and with a European-style crown in the middle, over a foil backing, and attached to a hand-cut tortoiseshell comb. The presence of the crown is a clear reference to the colonial Spanish influence on Luzon and the Philippines more generally. Similar combs are illustrated in Richter (2000, p. 287) and Cruse (2007, p. 121). Richter, A., The Jewellery of Southeast Asia, Thames & Hudson, 2000; Cruse, J., The Comb: Its History and Development, Robert Hale Ltd, 2007; Kassim Haji Ali, M., Gold Jewellery and Ornaments in the Collection of Muzium Negara Malaysia, Muzium Negara Malaysia, 1988; and Henkel, D., et al, Land of the Morning: The Philippines and its People, Asian Civilisations Museum (Singapore), 2009.